HYDMECH’s V-Series Vertical Band Saws are heavy-duty, high-performance vertical tilt frame metal cutting band saws. The V-Series band saw features vertical contour-style saws which are multi-purpose and able to cut a large range of materials – from steel to aluminum, to wood and plastics. 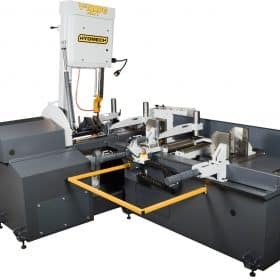 These versatile machines are designed with the flexibility to cut tight radius sections or larger cut-off sections while also providing the ability for cutting two-way miters. The V Series is available in semi-automatic and automatic modes of operation with cutting capacities up to 30″ and bar feeds from 40” to 120”. FABTECH SOLUTIONS carries a complete selection of HYDMECH Vertical Metal Cutting Band Saws for sale. The HYDMECH V-18 Semi-automatic Vertical Band Saw is a powerhouse for every metal fabrication shop, with the ability to miter from 45° left to 45° right there’s not a job that is to difficult. 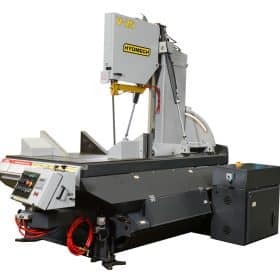 This bandsaw features a 18″W x 31″H capacity, 7.5 HP motor, and 1 1/4″ blade and that makes it the perfect solution for all your vertical metal cutting applications. The HYDMECH V-18APC Automatic Vertical Band Saw is a perfect solution for automated heavy duty metal cutting applications. The shuttle features automatic multi-indexing up to 40” in a single stroke with automatic kerf compensation. 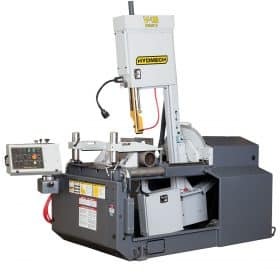 This vertical band saw features a 18″W x 20″H capacity, 7.5 HP motor, and 1 1/4″ blade and is an ideal choice for all your vertical metal cutting applications. The HYDMECH V-20 Semi-automatic Vertical Band Saw is a hydraulic metal cutting band saw capable of mitering from 60° left to 60° right. This band saw features a 25″H x 20″W capacity, 10 HP VFD motor, and 1 1/2″ blade. Its standard 4-degree forward approach angle provides increased efficiency in cutting of structural materials and makes it a popular choice for machine fabrication shops. 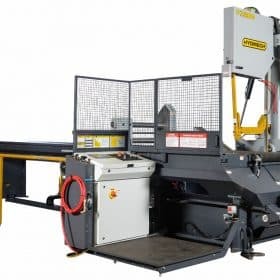 The HYDMECH V-25 Semi-automatic Vertical Band Saw is engineered to provide exceptional metal cutting performance and reduce material handling on larger applications. Its standard 6° degree canted head allows for more efficient cutting and improved blade life which is a value added benefit for every metal fabrication shop. With features such as a 30″H x 25″W capacity, 10 HP motor, and 1 1/2″ blade ensures that this band saw continues making clean and efficient cuts. 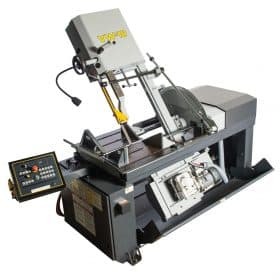 The HYDMECH V-25APC Automatic Vertical Band Saw is a fully hydraulic and completely automatic band saw, great for many heavy duty applications in high production metal fabrication shops. Featuring a 30″H x 25″W capacity, 10 HP motor, and 1 1/2″ blade; plus a high speed shuttle feed to index up to 60″ (120″ optional) in a single movement makes this the most versatile metal cutting band saw available. 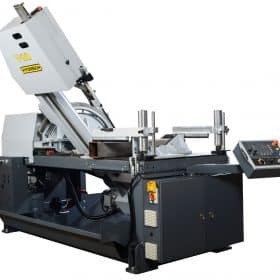 The HYDMECH VW-18 Semi-automatic Vertical Band Saw features a compact design that delivers versatility and superior performance on all your metal cutting applications. An important feature is the Quick Change Column which is standard on the new Series II. This allows the saw head column to be easily set upright at 90° or at a 3° forward cant. There is an easy to read angle scale and is equipped with stops at 60°.